Singita Faru Faru Lodge is built in an iconic, ground breaking blend of traditional building materialsused to create a stunning feel of retro-modernism. Here, the local influence is ever present, inspiredby rock formations said to have been left behind by prehistoric people. 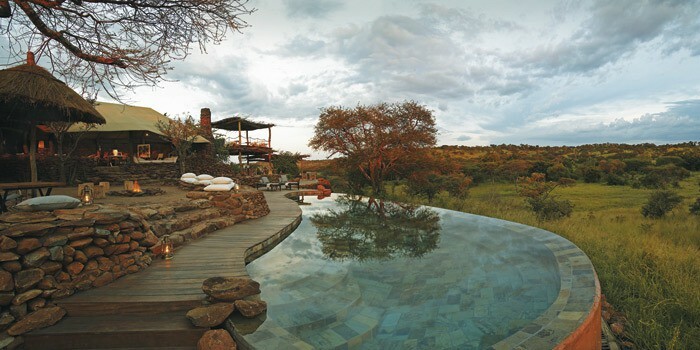 The elevated viewing decksover the waterholes provide privileged views over dry river beds and riverine forest. An intimate property that overlooks a watering hole and the Grumeti River. All activities take place within 340,000 acres of pristine, exclusive-use wildlife reserve.Faru Faru offers a dining room, elevated viewing deck, bar, lounge with satellite television and DVDplayer. A library, and the Singita Shop are also available. Leisure facilities include two swimming pools,game drives, bush walks and a spa complete with a fully equipped gym.Various charges payable locally. 8 air-conditioned suites with an en suite bath, outdoor shower, hairdryer, safe,telephone, wireless internet and a viewing deck. The Villa Suite is ideal for couples travelling together, or families, as it can accommodate 4 adults. It comprises two identical double bedrooms and a large shared lounge/dining area plus a private plunge pool. Breakfast, lunch and dinner, tea, coffee, all drinks, including wines, spiritsand liqueurs (excluding Champagne and connoisseur wines) are included.